This is book two in The First Law Trilogy. See my review of book one, The Blade Itself, and book two, The Last Argument of Kings. Bethod's armies are advancing on the Union from the north, aided by a massive giant and thousands of Shanka. From the south, the Prophet Khalul's forces creep upwards to retake Dagoska, expand their empire, and cleanse the world. Glokta, the cripped torturer for the Union's Inquisition, is sent to weed out traitors in Dagoska and save the city from attack. Meanwhile, Colonel West is baby-sitting the utterly useless Crown Prince in his first, brutal battle. And another motley crew of Bayaz the Mage, Logen the Northman, Jezal the pretty boy and Ferro the intriguing southerner travel on a quest none truly understands to find the one weapon that can end the war. This book sparked my post on racism in epic fantasy, but I hope that does not detract from my review of the book itself. This book is great, and I think I pointed out my reservations on it enough in my other post that I can just talk about the book (without "racial baggage") in this one. 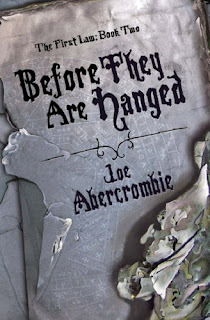 Before They Are Hanged is the second book in a trilogy, and so nothing is really "resolved" in a conclusive way. Didn't matter to me because I was completely engaged through the whole story. Even more than I was during The Blade Itself. There is a lot of traveling in this book, and a lot of waiting for enemy forces to attack. This gives the characters (and there are many of them) time and room to develop, and I was very pleased with the results. In my review of The Blade Itself, I mentioned how fascinated I was by the character of Glokta. In this book, I am still more fascinated. He is such a complex and deeply flawed man, but with so many redeeming characteristics that come out in this book. I think that, if things had gone differently in his past, he would have been a hero to everyone. As things stand now, he is only a hero (sometimes) to me and other readers of this book. He is only one of the characters who grew into his skin in this outing, though. We learn so much more about Ferro, the terrifying southern woman with a chip on her shoulder, and about Jezal, who reminds me of the very intriguing Jamie Lannister in George R. R. Martin's A Song of Ice and Fire series. And I fell a little bit in love with the Dogman from the north, too. Not to mention Colonel West. So many crushes, so little time! But these character references mean nothing to you, of course, if you have not read the book and so I will just say that if you enjoy epic fantasy, I think you'll enjoy this series. It's detailed, it's well-written, it's populated by varied and flawed characters who all speak with their own distinct voices. I really like how Abercrombie gives us detail on the world, but makes it clear that the main focus is on the characters. It's not about the magic and power and politics; it's about the effect of the magic and power and politics on the people. My only wish is for a map to peruse, but apparently Abercrombie is very anti-map. Sigh. Hihi, that was very antimap! The bookstore has these books, but in Swedish, argggg, no, I am afraid to read them and hate them if it is a bad translation. hate bad translations. But I so wanna read them!!!! The covers for both books are just fabulous. I haven't ever heard of these. I shall definitely look out for them. I am so glad you liked this book. In my opition, Abercrombie is one of the most intriguing authors in fantasy. His plots and characters are so tightly written, the reader starts to care way too much about them before she can realize it. And I share your frustration on the map thing (as you know) since this story is very geographically bound. Mr. Abercrombie has addressed this issue on his blog, but I don't buy his explanation (that it limits the reader). No it doesn't, maps just gives us some context! Have fun with the third book. Also, when I come home to Chicago next time, I will bring you my copy of Best Served Cold, which has a female heroine like no other. Sudha- Thank you for lending me these books! You're right- they're great to sink your teeth into for a quality fantasy world. And I completely agree about the characters. And the maps, obviously. As a reader, I cannot be limited. People should know this. And make maps. Oh yes I am sure I could find it online to get. English translates well, it is just that with fantasy, well the books seem targeted at a much younger audience. Like they think all who read fantasy are 12 yer old boys. After reading your review of The Blade Itself, I resolved to put this book on the top of my wish list and now I am excited to hear that the series continues to develop wonderfully. I am really intrigued by your descriptions of this torturer and think that I will be similarly invested in him as a character. You made him sound really morally complex and slightly ambiguous. I am so excited to begin reading this series. I will have to let you know how it goes for me! I have owned the first book practically since it came out, but I still haven't read it.